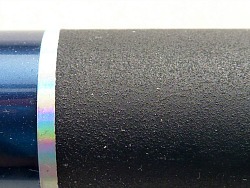 The Shimotsuke Kosasa is an inexpensive fiberglass kid's rod or micro fishing rod. I had purchased three of them several years ago to evaluate for micro fishing rods (one each of their 150, 180 and 210cm lengths). At the time, I decided not to carry them. I reconsidered, carried them for a while, and then decided again to not carry the rods. 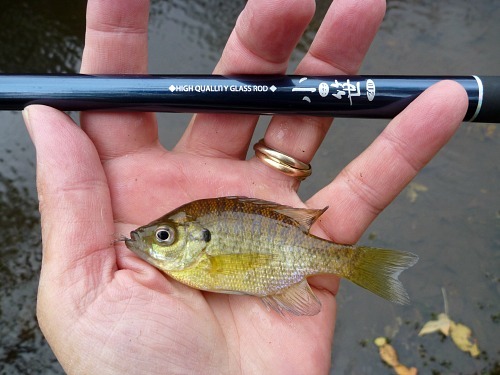 Jason Klass once published a post on his TenkaraTalk blog wondering why there was so little innovation from the various tenkara rod companies that seem to be popping up like mushrooms after a summer rain. He said the market is being flooded with rods that look the same and cast the same. He invited comments, and one that I felt stood out was from a British angler who asked for a £20 rod. "The cheapest rod on the market" that gets more people fishing. 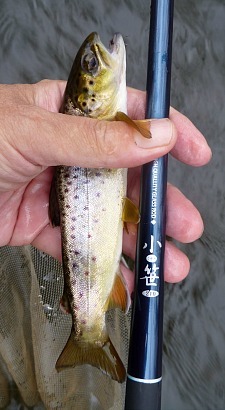 He felt it would attract many more anglers to tenkara. Well, £20 was about equal to $30-35 at the time. That reminded me of the Shimotsuke Kosasa. The Kosasa is a rod I could offer for $35. It is a quirky little rod, though. Start with the fact that it is fiberglass rather than graphite. That makes it a bit heavier than a graphite rod of the same length. It also makes it a bit softer and much slower than a graphite rod. Then there are the graphics. It says right on the rod it is a "HIGH QUALLITY GLASS ROD" but it misspells quality. 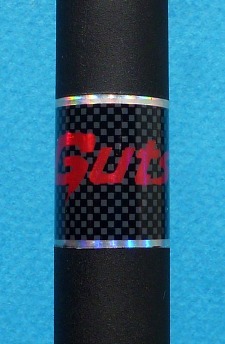 There is also the bold "Guts" logo in the middle of the grip. Gear junkies will roll their eyes but kids will love it. Before I started offering the 210, there were five people I know of in the US who had a Shimotsuke Kosasa. One was Tom Davis of Teton Tenkara. He had a 270. He hated it. One summer, a customers told me he wanted a very inexpensive microfishing rod for his grandkids. I sold him the Kosasa 180 I'd gotten last year. He liked it so well he almost immediately bought the 150 (I kept the 210 for myself). Another customer had gotten some Kosasa 240 and 270 rods from his son, who works as a translator in Japan. He loved the 240, kept one for himself, and sold three of the rods on eBay (of which one went to Tom). He said he hadn't heard any complaints from the other two buyers. So there you have it. I suspect this is a rod that either you will love or you will hate. I think kids will love the Kosasa 210. I think micro fishermen will love it (it weighs so much less than the 12' crappie poles some sites recommend and is much more convenient to throw in a day pack). For anglers who target smaller fish, it is soft enough that "a two inch bluegill seems like a whale" as the guy who bought two of them told me. I know some guys will buy it for tenkara fishing in very tight streams. If they expect the light, crisp action of a small graphite rod they'll hate it. If they prefer the slow action of a glass rod (which, after all, is what the Shimotsuke Kosasa is) they might like it. As Dan H said, slow down the cast. You still need a little wrist flick at the end to load the rod tip, and I would use 3.5 line, but it's just not too bad for a $35 rod! I think parents and grandparents who are looking for a very inexpensive way to introduce their kids or grandkids to fishing will love it. As the guy who got some from his son in Japan told me "It is not a toy." That's true. It isn't a toy, but it also isn't a quality rod (despite what is says). 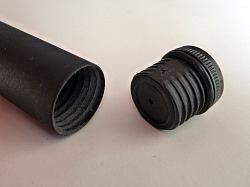 I would much rather that TenkaraBum.com was known for high quality rods than for cheap rods. The least expensive rod I carry is the Shimotsuke Tenkara Gen 240, which is $70. It is not a high quality rod either, but it fills a niche at the 240 length a bit better than any other rod I know of. I'll stock it until I find a better rod at that length. The Shimotsuke Kosasa reminds me of the Daiwa Soyokaze. It is glass rather than graphite, and thus is a bit heavier and has a much slower action, but the rod's construction and overall simplicity are very similar. Because it is glass rather than graphite, it will be harder to break. Please be aware that replacement parts may not be available, though. The grip is essentially a rough finish on the blank itself. It is really a very effective non-skid surface and is not too small to grip comfortably. (For kids, it's not too large, either). 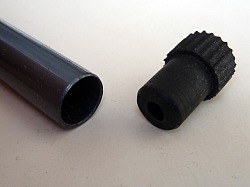 The grip plug is plastic, comes with a rubber O ring for a secure closure, and has a ventilation hole. As with other rods, I would recommend taking the rod apart between uses so that it can dry thoroughly. When I measured the Kosasa 210 and came up with 25 pennies, I was very surprised. 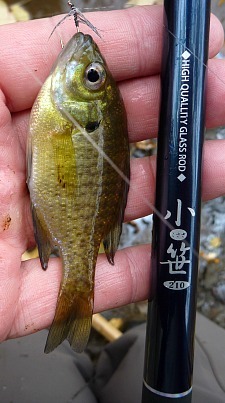 The rod has a fairly soft tip and the small bluegills pictured above put a good bend in the rod. It is not a rod that has an extremely soft tip and then stiffens up rapidly. It has a very smooth parabolic action and just gets progressively stiffer. I have not yet caught any big fish with the rod, but a rating of 25 pennies suggests the rod could handle some surprisingly large fish. The guys who go microfishing and end up catching largemouth bass may really love that. Kids who are catching their first fish should love it, too! This 11 1/2" brown did not come close to maxing out the rod. The 240 balances so well that it should not be too heavy for a small child. Have fished the 240 and it was a fun, I think the 240 is very cool if you slow everything down and use a 4 level line. When I first saw the rod, I saw it was made in China. That set up a red flag which was further heightened when I saw the "quallity glass rod" stamped on the barrel. I now wondered about the reliablity. I mean if they can't spell quality……. Other than that the cosmetics and finish were very nice. I am not a lover of rubber handles (probably because I'm a snob and rubber always looks cheap); but after handling the rod for a while I found the grip was quite comfortable and soon forgot about it. I immediately liked the action. The rod bends further down from the tip than the graphite ones I own. I took this as a good sign that the rod was stronger than, say, the Kiyotaki 18, and, so, should hold up to larger fish. Several fishermen came by and I let them try it out. They knew nothing about Tenkara. They all tried the rod and when three or four were done they asked where they could find one. I told them. They were even more enthusiastic when I told them the price. Part of the enthusiasm may be because they hadn't caught a fish all day and suddenly they were and Bluegills on that rod are fun. My kids love their new rods and I don't have to worry about them breaking anything expensive - you might consider using them for the kid's kits, as my wife commandeered the light carbon rod from the kid's kit within minutes of taking it out of the package. I'm not to sure if my grandson is ever going to get the 210. I tested it at a local gym this AM. It's like the old glass rods I grew up with.